Laparoscopic common bile duct exploration (LCBDE) is as safe and efficient as endoscopic retrograde cholangiopancreatography (ERCP) in achieving bile duct clearance from stones. No clear guidelines are available on LCBDE with respect to indications for trans-cystic approach versus choledochotomy, or regarding when to use either flexible choledochoscopy (FCD) or intraoperative cholangiography (IOC) guidance. From January 2001 until November 2006, 113 consecutive patients with common bile duct stones (CBDS) and gallbladder in situ were enrolled in a prospective non-randomized study to undergo laparoscopic cholecystectomy with LCBDE on an intention-to-treat basis. Twenty-three patients were aged 80 years or older with severe comorbidity. Preoperative ERCP with attempted stone clearance was performed in 24 patients. Laparoscopic common bile duct exploration was attempted for CBDS in the presence of acute cholecystitis in 24 patients. Laparoscopic common bile duct exploration was performed via the trans-cystic approach in 83 patients and via choledochotomy in 30 patients. 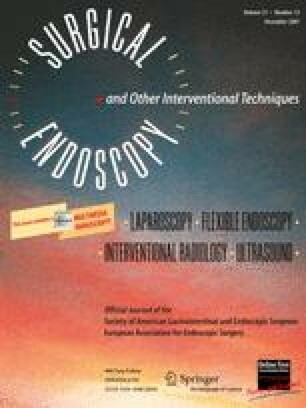 Flexible choledochoscopy was used in 79 patients and IOC guidance in 34 patients. No mortality occurred. Postoperative complications were encountered in nine patients. Laparoscopic stone clearance of the bile duct was successful in 91.8% of the patients. Median length of hospital stay (LOS) was two days (range, 0 to 24 days) after trans-cystic LCBDE and six days (range, 2 to 34 days) after stone clearance via choledochotomy (p < 0.0001). Choledochotomy was performed for CBDS measuring an average of 11.5 mm (range, 5 to 30 mm) in diameter while trans-cystic LCBDE was successful for stones measuring an average of 5 mm (range, 2 to 14 mm) (p < 0.0001). Mean duration of surgery was 75 minutes (range, 30 to 180 minutes) when FCD was used, and 107 minutes (range, 45 to 240 minutes) in patients undergoing LCBDE under IOC guidance (p < 0.0001). Laparoscopic cholecystectomy and LCBDE with stone extraction can be performed with high efficiency, minimal morbidity and without mortality. A trans-cystic approach is feasible in most patients, whereas choledochotomy should be restricted to large bile duct stones that cannot be extracted through the cystic duct. The use of flexible choledochoscopy is preferable to IOC guidance.